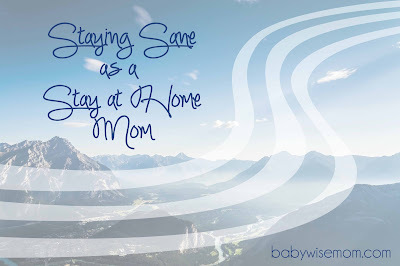 I had a reader ask me what I do to stay sane as a stay at home mom (SAHM). What a great topic! I think one of the hardest things about having your first baby is that sudden, total isolation you experience. You go from interacting with people at work or school to being home alone all day with a person who doesn’t even smile at you, much less talk to you. Getting out isn’t easy to do. You either have to pack up a ton of stuff or try to leave with someone like Dad home with the baby, which we all know results in mom stressing the entire time she is gone. And if you are a breastfeeding mother…well…that makes leaving even harder. These feelings of isolation are common to all mothers, no matter what your parenting style. When Brayden was born, I didn’t start following Babywise fully until he was about 9 weeks. I didn’t start trying to implement any sort of “pattern” to his day until he was about 4 or o5 weeks. Shooting for a schedule/routine happened more around 7 or 8 weeks. And I felt isolated. For me, he was my hardest baby to adjust to simply because I had no one to talk to for most of the day. We had just moved to a new neighborhood when Brayden was about 2 weeks old. I knew no one. My parents lived 1.5 hours away. I was the first among my close friends to have a baby, so they were all still working and living lives as usual. My husband was in school and working–gone from before 7 AM until after 8 PM Monday through Saturday…I was alone. When my girls were born, life was much different. I was amazed at even what a difference a little talking two year old could do for my day. How do we do this job and maintain who we are, who we want to be, and our sanity? Like all topics involved with parenting, I don’t think this is something one post on a blog can cover (if this topic is of interest to you, please be sure to read Motherhood: Some Uplifting Words). But hopefully I can give you some ideas, and hopefully you readers will be able to share your own ideas of how you stay sane. Maintain Hobbies: Before you had children, you had interests. Did you like to read? Did you like to sew? Scrapbook? Sing? Run? What is it that made you you. Do what you can to maintain these hobbies and interests. I know it is really hard to work these things in as you adjust to a newborn, but sometime around 3-6 months, you should be able to start getting a little bit of hobby time in there. Some babies are really easy newborns and allow you to jump in sooner. Stay Connected: Stay connected to your friends and family. Call people on the phone. Send emails. Stay updated on blogs, etc. Don’t cut yourself off. Social Networking: Some people might enjoy social networking through various sites. Perhaps Facebook would be your fun. Maybe you would enjoy a Yahoo! group or a site like Babycenter.com. On sites like these, you can find moms who have similar parenting philosophies, moms who sew, moms who are your same religion, moms who have suffered loss, moms with babies born in the same month as yours…you can connect with people who have similar interests to yours. Play Groups: Do you have a good friend or group of friends you could have play groups with? When Brayden was a baby, my friend Kelli and I got together almost weekly for a play day. It was fun for our boys and fun for us. You could also organize something simple and weekly like a day at the park each week. My church does a day at the park every week where moms who want to come, bring a lunch, and visit while the kids play at the park. Go Outside: There is something about fresh air and sunshine that helps bring you back to reality sometimes. One of the only things that got Brayden and me through our long days was a daily walk. Get Out: Get out of the house sometimes. You know how going grocery shopping is an “out” for moms? Sad but true. Leaving your house reminds you that the world is bigger than your house and that your “problems” aren’t so earth shattering after all. Exercise: Get some sort of exercise. Tracy Hogg recommends going for walks each day postpartum. I can see why. You get the benefit of fresh air, getting out, and getting your blood flowing. As you can, you can start adding exercise to your day. I remember one night after McKenna was born (she was about three months old), I was feeling overwhelmed and kind of panicky. I ended up going for a run, and when I came back home, I was totally fine. No more worries. Serve Others: One of the best ways to forget your own problems is to serve others. Volunteer how and where you can. This can be as simple as bringing a neighbor extra treats. Serve others, but don’t think you need to become superwoman who does everything for everyone. As a mom with young children, you have limitations. But you can still serve some even with young children. Entertain Friends: Have friends over. You will have fun and you will worry about something other than your children. Enjoy the Moment: Enjoy each day for what its. The time you have as a parent of young children is so short in comparison to your entire life. Something I hear consistently from older people is that they wish they had spent more time with their children. Does it get monotonous? Yes. Is it thrilling? Not always. But it is such a short tick on your timeline of life. While trying to maintain sanity, don’t go so far that you look past these children you are staying home to raise. Focus on What Matters: If you are feeling overwhelmed, cut out the things that are not necessary. You would be amazed what you can cut out of your life and the world keeps on functioning. Read Books: Reading books is a great way to stimulate the mind. Read Newspapers: Stay current with local, national, and world events. Have Date Nights: Go out with your husband on date nights. I think once a week is ideal, though admittedly much easier said than done. If you can’t leave your house for a date night, you can be creative with date nights at home after the kids are in bed. Remember the importance of marriage and keep your relationship alive. Develop Traditions: Develop traditions that you can all look forward to. Maybe you will decorate for holidays. Maybe you will go to a parade every Fourth of July. Traditions are fun things to look forward to. Teach Your Children: Spend time each day teaching your children. For older toddlers and up, you can have fun daily learning activities. You can bake cookies and do art projects. Play With Your Children: Take the time to play with your children. You will develop fond memories as well as a relationship. Today I played baseball with my children after lunch and was amazed at their abilities. Have Family Activities: Do fun things as a family. Fly kites. Go camping. Go swimming. Go sledding. Plant a garden together. There are so many fun things to do together as a family. Make this time period fun. Keep a Journal: Keep a journal of your joys and trials as a mother. You can write a private journal, type it in word, video tape yourself, or even blog about it. Whew! Lots of ideas to get us going. So what do you do to stay sane? What works for you? I think what has kept me sane is a process called "bless and release". Sometimes you just have to admit a person being in your life is no longer good for your own mental health. After having the twins and leaving the work force I was met with lots of my "friends" opinions about what I was doing with my life.I allowed them to get me down and question my own choices for way too long until I decided to just "bless and release" them.I cut ties, removed them from my facebook, deleted their email addresses and phone numbers. Being a SAHM, you are hard enough on yourself, the last thing you need is someone else being hard on you too. I felt free and more focused on the relationships with people who supported me. If those who I have released ever need me (perhaps when they have their own child), they have my email address but until then, I've stopped actively communicating with them. Question: My baby is 3.5 weeks with reflux – on Zantac. Just wondering what to do with her naps. She cannot get through an entire nap. Any advice? I don't feel like CIO is appropriate yet because I'm afraid she is in pain. She does sleep well in carseat. Is that a prop? I want her to learn to sleep in bed. (Crib wedge doesnt' seem to work). Paci works too but again, I dont' want her to get dependent on it. Advice from any and all is appreciated! I have a little online "business" which is my hobby. It brings in enough money that when I want to go out and play with my friends, or go shopping I can do so without feeling like I am delving into the family budget. My little 18 month old girl and I love to go out to lunch together– this is what I do to stay sane! I try to plan one activity a day for us, whether it is going to play group, swimming, the library, or just the grocery store. And I try to go for a long walk or run once a day, by myself if possible. I usually go in the morning before my husband goes off to work so that he can watch the baby. Most of the time, it is the ONLY time of the day I am by myself, so I really enjoy that time.You listed some great points…I think its time I add a new hobby to my life. Thanks for your advice! Thank you so much for this post! My first child is now 14 months and I have been PRAYING for summer to come and STAY! With her being so active now, I feel like nothing I can do inside of the house is entertaining enough for not only her, but me!! I feel like she gets so bored of me! And since the weather has still been so crummy lately here, summer cannot come soon enough! But these tips will definitely help on the days we can't go outside! Thanks again! I love this topic, I am a big believer in taking care of mom for happier kids. My daughter is almost 2 now but I remember doing alot of things on the list and it does help so much! my family is 5 hrs. away so I had to ask for help (never easy?!) from local friends and other supports.I also joined my local moms club when my daughter was about 8 months old; having set playdates and events really helped me look forward to seeing other people.Great topic! my LO also has reflux and it has been challenging- but val your blog has been SO helpful! Our dd started prevacid at 2 wks, which we also nervous about, but knew we had to do something since she was in so much pain. We also use a paci for her naps and to help her "keep it down". I really see that using the paci helps with her pain. So we give it to her for naps, but only put in once (after that she's on her own) with the exception being, if she cries out of PAIN- them we put it back in until she's drowsy enough to fall asleep. At one week old we let her CIO so to speak. If we could tell the only issue was tiredness, we let her cry 15 min and then we would check on her. (Usually there was a wet diaper when we did). Afterward, we would lay her back down and try again. We always checked on her at 15 min (unless it sounded like she was almost asleep) and it never took her more than 15 min to fall asleep while really crying. Later WIO took 30-40 min 🙂 Her naps started out short 30-45 min but we were consistent as much as possible and we never felt guilty for taking care of her, giving a paci, and doing anything to help her with the pain of reflux. Val's "sitting" suggestion has also been great, since sitting dd completely upright for several min before a nap or nighttime sleep is really helpful for her reflux. Also keeping baby from becoming overstimulated (no jiggling, patting, etc) really helped our reflux issues- again val's suggestion:) Now she naps 1- 2 hours at a time depending on the nap and falls asleep with no crying with one waking at night. She is 9 weeks old. In fact crying is so unusual for her now that we check on her immediately b/c it means something is wrong. We have found that tilting her crib is very helpful… She cannot sleep flat:(. And babywise has been no problem for us. We have already been getting the comments, "so you're blessed with an easy baby?" and "why doesn't she cry?" Which is funny since we know reflux babies are not 'easy' and DO cry! 🙂 I have also had success using a swing during evening fussy time which didn't seem to interfere with napping or nighttime sleep skills. Hope my experience is helpful! Val, I would love to hear how some working moms continue babywise and adjust to being outside the home for work if you know some! I wish I had had this when I had my son! (Who's now almost 2!). I was teaching high school fulltime until a week before he was born, and it was A MAJOR adjustment for me. I honestly believe that I was a little depressed for the first year I was home, just because I missed the daily schedule, had a hard time adjusting to nighttime feedings (being very tired and getting sick often as my immune system was down), missed friend associations, and was breastfeeding and felt extremely tied down. I also had to adjust to being a homemaker, something I never liked, but which was now my (almost sole) duty as I was not 'working' anymore. I finally learned to relax and let go a little, and take some time for myself. Datenights were implemented. I started getting to know women in my area with children when I went for walks. I joined a neighborhood book club and a craft group. I developed some hobbies (mostly art/creating). I started a blog. I served in my church (service REALLY is a great tool to forget about yourself!). I read read read books. I make it a point to go out every day (whether to the store or the park or the library). I kept in touch with other teachers in my field because I do want to go back to teaching someday. I actually taught a college class for one term. (While my husband or my mom took care of my son), which was a great, temporary, situation. I MADE A SCHEDULE FOR MYSELF! (This is a biggie!–for housecleaning, exercising, etc. )The adjustment to my daughter (who's now almost 3 months old) was a BREEZE! because I learned strategies to stay sane.I hope this helps other first-time sahms out there so they don't have to go through what I did, at least not for as long! Thanks for everyone's comments on my reflux baby. Also, just in response to some of these other comments, I am a fulltime working mom and would be happy to share my experiences. My first baby is 16 months now and is a babywise baby – all with me working full time too. Did I stress about it? Yes, but it has worked out. Val, thanks for that. I think that is a good point. Sometimes there are relationships you need to call it quits on. Roberjen, Be sure to see the blog label "reflux" for all info on it.I think it is fine for a reflux baby to sleep in something sitting up–but do be careful about the carseat. Recent (within the last year) warnings have come out against it. It can shut off airway and babies can also strangle on the straps (happened here relatively recently). You are welcome to everyone and thank you all for adding your own ideas! Rachel, thanks for sharing all of that!So far as working, I do have a post from working moms on daycare, I believe, so that might be of some help. I will put that down to add to get some guest posts.